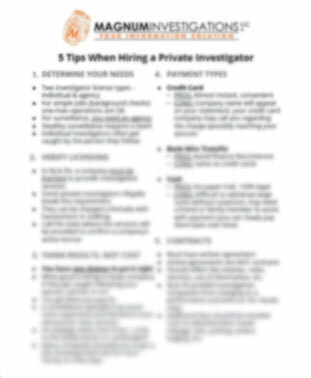 However, while these checkpoints appear obvious, many prospective customers are drawn to particularly under qualified or completely unqualified investigators for all the wrong reasons. They may give in to the lure of advertisements which make bold and often false promises suggesting that investigators work under the same conditions demonstrated on television film. Or they might simply be price shopping and their deciding factor will be how much the investigation will cost rather than the qualities of the surveillance findings. Shady investigators will mask their work under the guise of mystery, indicating that your best bet is to let them do their job without asking any questions. They truly believe that you should blindly trust their instincts and simply pay up and be thankful that they spared you the gruesome details. Start with assessing the website: if a company does not disclose who the business owner is along with a bio then you need to be cautious. If a company does not disclose where they are from and instead claims to cover the entire United States then you need to be cautious. Next, Google the owners name to ensure you are not dealing with someone of questionable character. Finally, call each prospective company to learn more about whom they are and how they can assist you with your situation. Be careful when selecting a company because an inexperienced or unlicensed agency could get caught and create more havoc with an already stressful situation. If this should occur or you aren’t happy with the job, there’s a good possibility that this company will not disclose who the owner is and they may not be working legally within your state leaving you with very little recourse. The truth is that a legitimate professional surveillance investigator, such as those at Magnum Investigations, doesn’t need the false sense of security provided by a veil of mystery or try to impress you by bragging about various television and/or radio shows that they appeared on as a guest. Rather, Magnum Investigations assesses your situation and makes sound, professional recommendations on how to best assist you without making promises that can’t be delivered. Magnum Investigations is an upfront, experienced investigative agency that doesn’t find it necessary to dress up the reality because the quality of their work speaks for itself. The choice, as always, will ultimately be yours. But hopefully you choose to focus on the facts instead of someone else’s fiction.